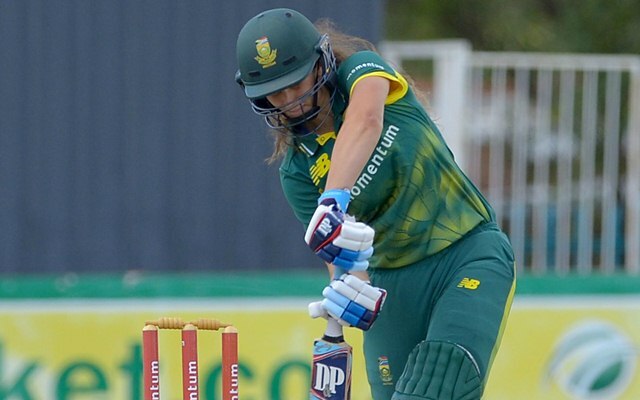 South Africa Women completed a whitewash in the 3-match T20I series against the Sri Lanka Women following yet another compressing win during the last and final game. Sri Lanka did make a mark in the 2nd T20I but failed to close down the game in the final overs. The Lankan Women will be fancying their winning chances once again with the absence of Lizelle Lee and Chloe Tryon who add power to the hosts. Even during the T20I series, the South Africans did feel the absence of the duo in key situations. Sri Lanka has the same squad for both ODI and T20I formats. Saffers, on the other hand, have a few tough and bold decisions to be taken to move forward in this series. The series will be crucial for both the teams with respect to the ICC Women’s ODI championship as they are currently slated to bat at the No.7 and No.8 respectively. The first game of the 3-match ODI series between South Africa Women and Sri Lanka Women will be hosted by the Senwes Park in Potchefstroom. The match starts at 10:00 AM local time (8:00 AM GMT) (1:30 PM IST). This match will be televised by South African broadcaster, Super Sport. However, there will be no broadcast in India as of now. South Africa Women: L, W, L, L, W.
Sri Lanka Women: W, L, L, L, L.
The Senwes Park is generally a high scoring venue for the Women’s cricket. Scores around 250 can be expected in the game between the top sides. Sri Lankans are expected to finish above 150 unless they put on a good effort with the bat while the hosts could be seen making 220+ despite missing a couple of big hitters. Laura Wolvaardt, Faye Tunnicliffe (WK), Sune Luus, Dane van Niekerk (C), Lara Goodall, Mignon du Preez, Marizanne Kapp, Nadine de Klerk, Shabnim Ismail, Tumi Sekhukhune, Masabata Klaas. Bench – Saarah Smith, Andrie Steyn. 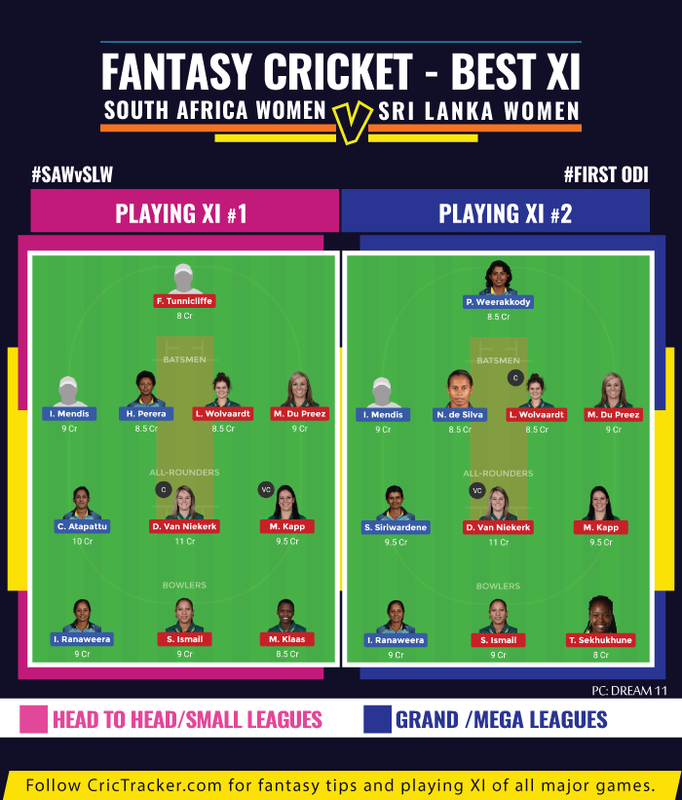 Hasini Perera, Chamari Athapaththu (C), Imalka Mendis, Nilakshi de Silva, Prasadani Weerakkody (WK), Shashikala Siriwardene, Umesha Thimashini, Oshadi Ranasinghe, Udeshika Prabodhani, Inoka Ranaweera, Kavisha Dilhari. Bench – Harshitha Madavi, Anushka Sanjeewani, Achini Kulasuriya, Tharika Sewwandi. Sune Luus and Nadine de Klerk replace Chole Tryon and Lizelle Lee respectively. Tryon suffered an injury while Lizelle failed to match fitness standards of the team. Zintle Mali also couldn’t recover for the ODI series. Laura Wolvaardt averaged 41.63 in the ODI format in 2018 which is lower than her career average of 45.77. The 19-year-old scored 458 runs from 13 innings in the previous year. Wolvaardt had good starts having scored over 20 in ten innings and bagged single figures in another three. Her highest score read only 70* which is something she would like to convert this time around. South Africa captain Dane van Niekerk is the ideal option as captain or at least vice-captain. Sri Lanka Women are known for their unpredictability in selecting the batting order. A clear picture will be visible regarding the Lankan batting order after the first game only. South Africa Women are expected to start the ODI series too with a big win against the Sri Lanka Women.